As some of you may know, we’ve recently ran a successful survey for our megaventory customers and one of the insights that emerged, is that a significant fraction of people out there prefer a shorter form of content and analysis/opinion articles. In order to accommodate both of these preferences we thought of the following idea for a series of posts: every now and then in this megaventory blog we’ll be rounding up a couple of such links from the broader small business, ERP, inventory management and order management blogosphere which stood out as the most interesting in our radar - and we’ll present them here along with a short commentary. So here it goes - the post may be long but you can easily focus on the parts you prefer best. Few enterprises are acknowledging consumer tech provides the new benchmarks for their industries. Amazon and Google data centers are more best practice than those of IBM and Accenture. Foxconn’s contract manufacturing of many consumer products is redefining economics, quality and time to market expectations for outsourcing. PayPal’s micro-payment capabilities are better than those of much larger banks. It takes a brave board like J.C, Penney’s to hire as its CEO the head of Apple Retail. In short, consumer-facing companies set the standards for business-oriented ones. 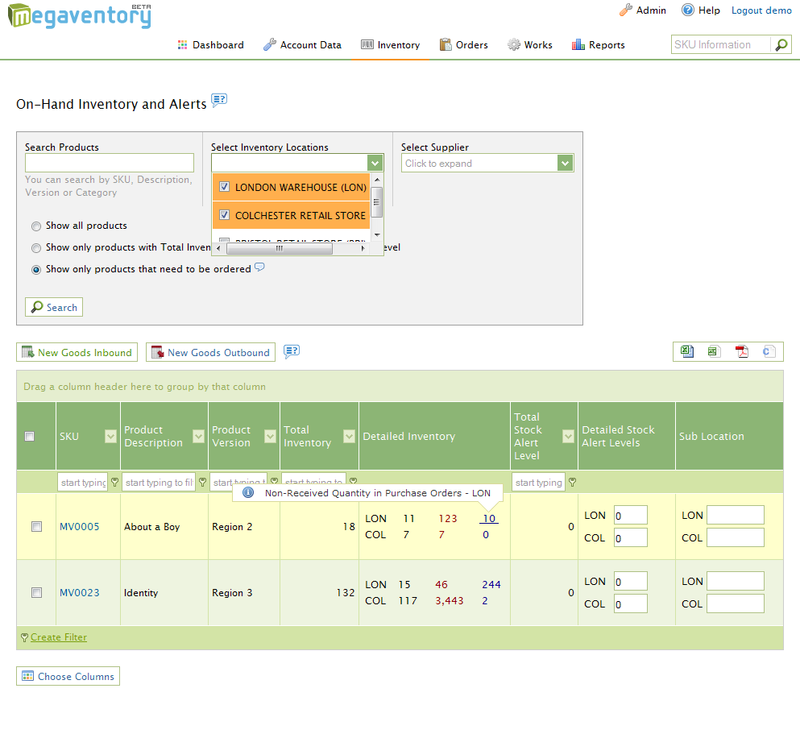 And the online inventory management business is no exception. 2. Silicon Valley Can Do Better Than Facebook A much discussed and re-shared article which takes the view that Facebook and its hyped IPO actually damages the business ecosystem. It does that by showing aspiring small businesses that the way to be the most successful is to get people to play silly games, virtually poke each other and click on ads. Instead of having real impact on real world pain points, that is. There’s truth in the argument. But, similarly to the above post, Facebook and other companies which focus on providing the best customer experience achieve something else too. They force other traditionally boring industries (e.g. ERP) to become much more appealing and accessible. Jeff Kaplan, migration management consultant and former analyst was interviewed in Intacct’s blog. Again the pattern of ‘corporate users who have been exposed to the ease of use with consumer applications’ appears but Jeff touches on how much network/server accessibility is an issue on the cloud (not really), the top cloud benefits (see Megaventory’s take), the innovative directions the cloud pushes towards (better social, mobility and analytics) and the evolution of the industry (do read that bit especially). Good stuff. ZDNet’s Phil Wainewright makes an observation that large companies which want to move quickly in emerging markets or get fast feedback on a market, quickly implement a SaaS ERP in their respective business in order to get results as soon as possible. And it is these short response times that also makes SaaS appealing. The excellent extension to the fact is of course that who doesn’t need break-neck speed in their results these days? In today’s world where businesses are constantly behind their schedule (at least those who want to be honest with themselves), nobody has time for changes that take time. As long as your business is smaller than a certain size software-as-a-service ERP makes all the sense in the world for a number of reasons. Cost, efficiency, scalability, multi-location benefits, mobility, even security are all factors to make you choose the online instead of the traditional approach. Once that decision is behind you however the next step is to decide on which of the existing platforms you should adopt. A quick research might reveal that there are many solutions out there. Each has its own set of features, its own pricing, its own peculiarities overall. Here’s the thing though: provided you’re not after a very specialized feature (and you shouldn’t be if you’re an small business), by this point down the evaluation path all the companies in your shortlist will seem rather similar or equal. And your impression will be correct - because, and at the end of the day, all online ERP companies share their core functionality and differ in the extra, not so crucial features. So how do you decide? Here’s an argument that you don’t hear often enough - usability. You would have thought it makes sense right? Still, people usually decide mostly on other reasons (number of features and cost for example) and they end up with something that takes a lot of time to learn, working with obscure menus, and generally resenting each day they see an ugly interface first thing in the morning. It doesn’t need to be like that though. There are a lot of things you should be looking for when choosing an ERP vendor (or developing them if you are the ERP vendor). First of all, the interface design should work. The layout itself needs to be self-explanatory and helping users navigate themselves through its many options. Usually this is in the opposite direction of pretty but it’s in the direction of helpful - and that’s more important. Proper categorization of functionalities is crucial so that users don’t get lost in too much information. In fact, the design should revolve around the users and common tasks they have to do, not around whatever internal category of features the company offers. A lot of testing needs to have taken place to get this right - with real people - but when you do, it shows. Help should be readily available - not on another window, a help file or a community section. Right in the website buttons and fields should explain what they do (see the AdWords interface and how much helpful information Google has crammed in it). Hovering the mouse on pretty much anything should show what you would otherwise need to look up in a FAQ - and disrupt you from your actual work. Also, for beginners in the world of ERP or for users who just start on the company, game-like on-site tutorials or guided tours are an excellent way to get people familiar with the platform quickly. You should really offer that to your employees or your colleagues when choosing an ERP. These are but a few of usability related items to keep an eye out for when deciding which ERP to use. Most vendors are not paying attention to offering a user friendly experience but as industry matures more and the feature sets converge, it will be whoever offers this ‘simple’ differentiating factor that will win the day. a) Inventory Transactions & Invoices Documents can now be saved in the Pending State. While in the Pending state, no actual inventory movement is committed and no costs nor revenues are updated. The actual movement takes place when the document is verified. The Verify action also assigns the correct subsequent number to the documents according to the document type. b) Inventory Documents cannot be deleted nor the Product Details can be edited once the documents are verified (since actual item movements have been committed and a subsequent number has been assigned). c) Full user activity logs are available per document in the History tab of the document. e) Creating/editing an Inventory Transaction or Invoice document is significantly improved in terms of speed; the Client/Supplier, Document Type and Inventory Location are selected in one single page and all operations are performed using web-services eliminating the need for page refreshes. f) Invoicing of shipping only /receiving only documents (such as Goods Inbound / Goods Outbound) will be disabled. Invoicing of such documents can be done only against a Sales or a Purchase Order from the Sales or Purchase Order interface. A new document type has been introduced to handle the returns that your company ships back to its suppliers (for example, defective items). As expected, the creation of the document reduces the inventory and adjusts the costs of the items included in the document. As you may already know, the Goods Transfer handles the transfer of items between Inventory Locations. We have broken this operation in separate 'Shipping from' and 'Receiving To' actions so, in the new upgrade, the shipping and receiving actions do not happen instantly. If a Goods Transfer is only shipped then, the items in the document are handled by a new internal location that has been named 'in-Transit' location. Then, in the receive action, the items are received from the 'in-Transit' location to the actual location where we intend to receive items in. A new Account Reset option has been introduced (partial reset). 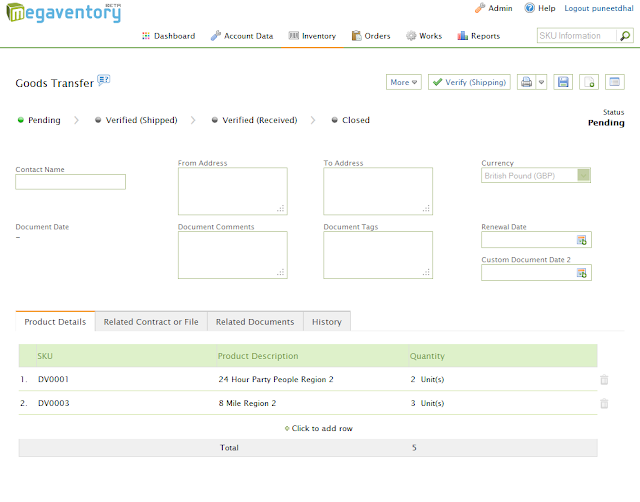 This option zeroes the inventory but preserves all account data (products, suppliers, clients, etc.). Such an option can be used after a user has finished evaluating megaventory during the trial period and is ready to go into production where real orders and product movements take place. A new Inventory Taking module has been introduced that can be used for a) getting initial product quantities into megaventory and b) for performing physical inventory counts to adjust inventory. 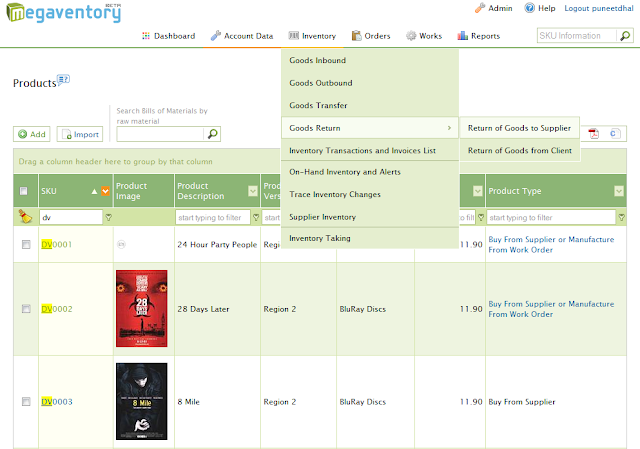 The Inventory Taking procedure is pretty simple: The user downloads an Excel file that is preloaded with the products of the account. 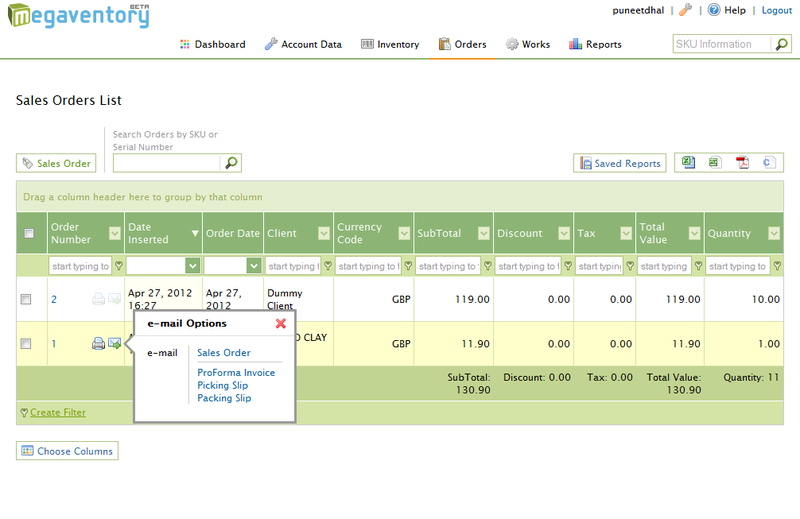 The quantities and product costs just need to be added in the file which can then be uploaded as a CSV in the account. This can be seen from the screenshot below. 6. New display of documents in lists. a) The print/email icons have been moved in the same column together with the document number and the document number has been made a link that open up the document for viewing/editing according to the user's permissions. This eliminates one extra column in the list and also the view/edit opening options making it easier for the user.to open up a document. We have also dealt with more that 50 minor improvements and bug fixes to make your life easier. This has been our most impressing upgrade as of yet! Now, let's get back to work! Next upgrade will include some breaking changes in our reporting module! In our effort to make the life of small and very small business owners that much easier, we decided to collect all useful content that's been posted in this blog in a handy PDF guide. The 'Online ERP Guide' is made up by two sections. The first part introduces the basic concepts (what is ERP, the basic benefits from using ERP for your business, the choosing criteria, etc). The second part goes through the major online ERP vendors for small and very small businesses and reviews its functionality and features. The two components put together -along with our glimpse of what lies next in the field- should make an excellent read for any entrepreneur running a small business in need of an ERP. So, if you are a small business owner, make sure you forward the e-book appropriately. Of course, it can also be downloaded here: Online ERP Guide. If you do not know what ERP is, it is software that maps real-life business processes in the computer for analysis and reporting. A business process for a project manager may refer to adding a note to call a group of project engineers for a Skype meeting; for a salesman, a business process may refer to following up on last week’s sales leads; for a warehouse manager, a business process may refer to picking, packing and dispatching. So an ERP may have modules to support operations such as Project Management, Human Resources, Order fulfillment, Inventory, Accounting and so on and so forth. We’ve also wrote an introductory blog post about what ERP software is. ERP has always been extremely expensive software. I never really understood why, but I guess it all starts because the cost of failing to deliver can be much much worse. It goes into the psychology of the ‘you get what you pay for’ so, if you were a manager you wouldn’t run a billion dollar company with a software that costs a few hundred dollars would you? And, if you are about to pay millions for a piece of software you might as well ask the software vendor for any customization that comes to your mind. No matter how crazy the demands, the vendor’s sales people always say yes and then, one thing is for sure: those customizations make the software more complex and difficult to work with. Your employees will complain and fail using it, the ERP will fail to deliver and the manager will run back to the vendor to buy some expensive after sales support. This deadlock process was -and still is- feeding dollars to huge companies such as Oracle and SAP. This IS their business model. This IS changing. How? Read on. How low can the prices get? Well, even now, the cost of an online (cloud) ERP is around $5 to $10 per user per month which is a cost every business can more or less afford. The cost can get even down to zero from those cloud ERP vendors that will be able to offer Freemium plans. Not all vendors will afford to offer a free -limited feature- plan to their user base but some will definitely do. Yes, I know everyone is talking about this but, the truth is, no-one has really implemented that feature as of yet. Yammer is on its way of doing a great job by building a social communication platform that can integrate data coming from multiple business software on a single feed/timeline. This is the beginning of a whole new concept in business; social entities will not just be confined to chat and communication messages but operational information will get their place in the social feed/timeline: manufacturing processes, sales events, inventory alerts, EDI (Electronic Data Interchange) alerts et cetera can get a social substance and be distributed to the correct people inside the organization or even outside of it. The social trend can get really interesting when a user -or a group of users- will be able to act on intra/inter-organization operational information from their social feed/timeline. Imagine for example that, as a user, you maintain a ‘friend’ status with your supplier so you get to receive -in your social feed- all those actions of your supplier that are related to your company. So, the moment that your supplier invoices you, you receive that invoice information in your social feed/timeline and you click to see and verify the correctness of the invoice. 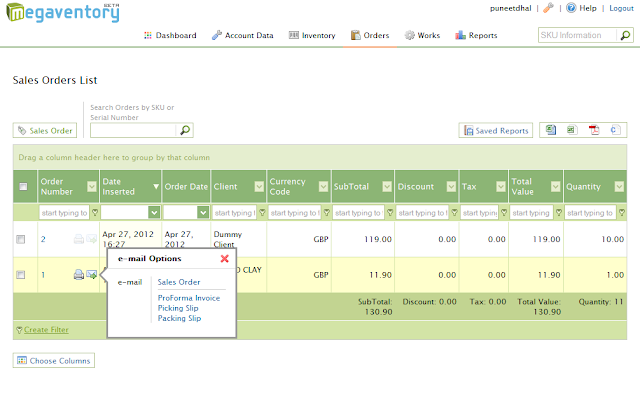 Then, when goods physically arrive, you click to log this invoice in your sales software to receive the invoiced items in your warehouse automatically. It is an EDI system on steroids! Adding operational info in one’s organization social feed/timeline will bring collaboration to a whole new level introducing significant improvements both in terms of optimizing processes and minimizing mistakes due to miscommunication. Business software makers have already began looking into concepts that exist for years in the gaming industry. By implementing user interfaces that dynamically interact with their users to offer virtual rewards under certain conditions (for example if specific key performance indicators are met), the otherwise boring business software can instantly get more interesting and fun to use. If users are happy using a software, their productivity will increase as well. Can business software such as ERP be fun? So what is the future of ERP? Well, couple the gamification concept with easy-to-use consumer devices and a social software infrastructure and you will get an idea how business software is going to look in the next years.